The senator quilt was a three year project of JBER's 2 Rivers Torch Club/4H Citizenship Club. The youth, with the help from their adult leaders, spent one and a half years writing Senators and sending quilt squares to be signed. The Senators signatures were tracked on a US map. After all the signatures (57 after three mailings) were sent back youth assembled the quilt using recycled blue jeans they collected. 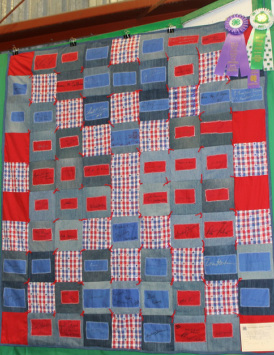 The youth sewed the signed red squares to the blue jeans squares and I sewed the squares together, because we quickly discover if more than one worked on this, the quilt would not line up. We made a mistake on one square, turning it backwards, but instead of turning it around our youth decided to dedicate the turned square to our fallen military. In the end we wanted to sew the quilt instead of tying it, but our sewing machines would not sew through the thickness so we tied the quilt. All youth and staff that worked on the quilt signed it too.